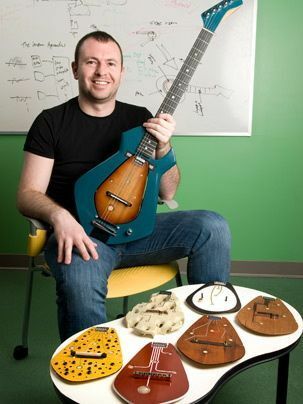 MIT may be an unlikely source for stringed instrument design and innovation but that’s not stopping Media Lab student Amit Zoran. He’s been working on a new approach to guitar in collaboration with instrument builder Marco Coppiardi. Many current attempts at redefining the guitar focus on the use of modern electronics. And while the Chameleon Guitar doesn’t shun this approach, it starts with analog roots. It begins with wood – that magical material at the heart of our most beloved instruments. Interchangeable soundboards contain piezo pickups which provide an acoustic source for sound modeling. Various woods and bracing techniques have been tested and fed to the modeling engine which can also model guitars of various sizes and shapes. With this level of diversity, Amit sees the Chameleon Guitar as a tool for the professional musician. Rather than depending on multitude of instruments, the recording or gigging player would have an array of sounds at his or her disposal simply by changing sound boards built from different tone woods. Still a thesis project, Amit is working toward a commercial model down the road. Overall, its an interesting idea with possible applications in bass and other electric stringed instruments. But it remains to be seen whether this latest attempt at redefining the future of guitar will take off. Amit â€” I agree with you, I really like the fluid-filled soundboard concept. Excellent creative thinking, with potential to extend tonalities. Overall, the guiding philosophy behind this system seems to be to gather audio information from multiple data points â€” on a near-molecular (nano) level â€” then interpolate the information using computer analysis combined with synthesis to amplify the interactions. Essentially, we are listening to the audio equivalent of viewing an electron microscope image. Sound waves move four times faster through fluid, due to density differences when compared to air, and this â€” combined with our air-adapted hearing mechanism â€” influences our perception of the source. Think of whale or porpoise communication, or the pre-delayed but focused impression of sounds you hear when swimming underwater. Cetacean vocalizations cover a wide frequency spectrum, but usually as a variable sweep rather than simultaneous full-band emission. Combining nano-amplification with fluid-based sound transmission â€” perhaps modulated through an expression foot pedal â€” is exciting to contemplate. What about extending the concept by using a captive body of water (pool, for example) with multiple listening points as an effects or synthesis chamber? Doppler shifts and Q filtering would become emphasized and easily perceptible. That’s quite ingenious, if you’d ask me. Ever onward, continue to develop. Like all bits of engineering, there are tradeoffs. I would note that the strings are anchored on the main body – not the insert – so that simplifies the issue of tuning. Still its not as simple as picking up another guitar for a sound. But given the possibilities and the fact that this is still an idea under development, it’s too early to say where it will end up. I think Amit’s ideas are great. His previous project, the reAcoustic eGuitar (http://ambient.media.mit.edu/assets/z1_my_guitar_my_best_friend/Guitar2.jpg), blew me away completely when I saw it. However, I’m not 100% sure about the need for the electronics. I first looked at this instrument as the “purist’s” Variax, replacing electronics engineering with lutherie. I definitely look forward to following the progress of this project.